Who would have thought getting into Harvard would be the easy part? Having spent last season with the Crimson, Louis Leblanc was faced with a life-altering decision: Should I stay or should I go? After careful deliberation, the No. 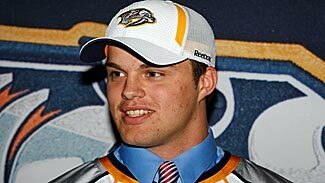 18 pick in the 2009 Entry Draft recently decided to leave school and sign a three-year entry-level contract with the Montreal Canadiens. While thrilled about his choice, the 19-year-old center acknowledged the challenge. "It was a hard decision, for sure," he told NHL.com. "I loved Harvard. Maybe one day I'll be back there to finish my degree, which would be something special. But I wanted to play more games and try to get closer to playing in the NHL." Unfortunately, the contract doesn't guarantee the Quebec native a roster spot with the Habs come October. In all likelihood, Leblanc will spend this coming season playing with either the Canadiens' AHL affiliate, the Hamilton Bulldogs, or the Montreal Juniors of the Quebec Major Junior Hockey League. Either way, the journey to the NHL remains a long one, but he's already taken an important first step by being among 46 invitees to last week's Team Canada World Juniors development camp in St. Johns, Nfld. For Leblanc, merely being involved felt gratifying. But he couldn't help but pay attention to what could be. "It's a great honor," he said, adding that "99 percent of kids are home with their families for Christmas [when the World Juniors take place]. But I'd rather be on the ice playing for a gold medal." And, as is the case for most Canadian players, preferably against the United States. After a stunning 6-5 overtime loss to the Americans in last year's championship game, this year's pursuit for the gold is wrapped under a blanket of revenge. But while there's no lack of motivation, Leblanc adopts an "under-promise, over-deliver" philosophy. "It's something we know about," he said. "But it's been pretty quiet around here about that. I think we're just focused on what we have to do now." Leblanc's understated approach has helped pave the way to any number of hockey accomplishments thus far. 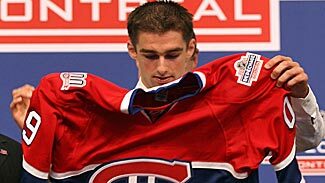 Despite accolades that include being named the 2010 Ivy League Rookie of the Year and projected as the next big thing in the Canadiens' rich history, draft day 2009 remains the highlight of his young career. "It was a special moment," he said of being selected at the Bell Centre by his hometown team. "I didn't know what to expect, and it was an exciting night. But being drafted in your hometown put it over the top." Leblanc is the first Quebec-born player selected by the Canadiens in the first round since 1988. While there's great pressure surrounding anything related to Canadiens hockey, Leblanc -- even at a young age -- already gets the bigger picture. "It's a dream come true," he said, referring to being drafted by his favorite boyhood team. "But now it's back to work. I still have to make the team first." Leblanc is poised to turn heads at both the World Juniors development camp and the main training camp with the Canadiens in September, and his experiences at Harvard under coach Ted Donato will help. "[Donato] was a great coach," Leblanc said. "He taught me to how to read defenses more and just helped my overall game." Being drafted, playing a season at Harvard and now scrimmaging with Canada's next wave of talented players has already rubbed off on Leblanc. During last year's Stanley Cup Playoffs, Leblanc admitted to watching the occasional Habs game in what he called "the best building in the NHL." But bias notwithstanding, the game he grew up playing had a different feel to it, given his new place as an NHL prospect. "You look at the game differently," he said. "You're seeing certain players and you know that eventually they might be your teammates. It's a great feeling." One that he looks forward to sharing for many years in hockey's Mecca -- the place he also just so happens to call home.